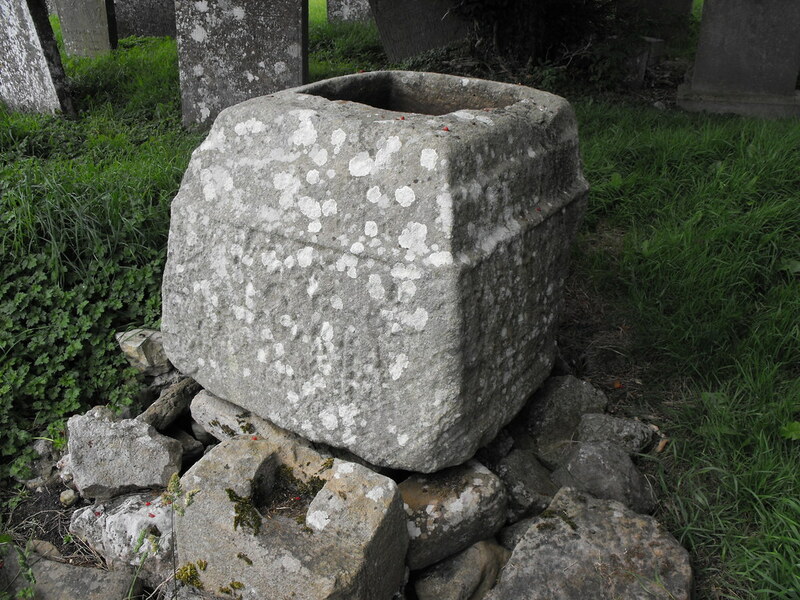 The Standing Stone: Churchland/Clonmore, Ecclesiastical Complex, Co. Offaly. Churchland/Clonmore, Ecclesiastical Complex, Co. Offaly. 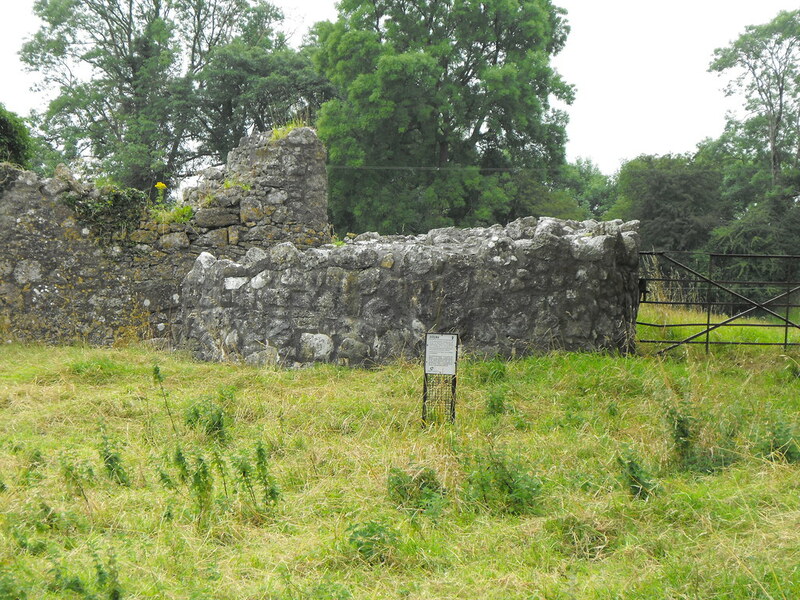 Location – On the R421 roughly 5km N of Leap Castle. 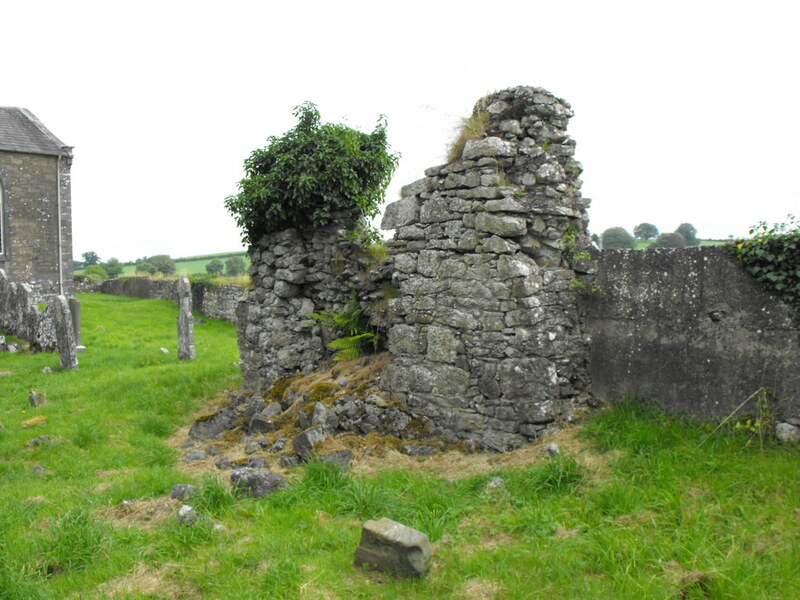 The majority of the remains are located within the boundaries of the modern Protestant church. 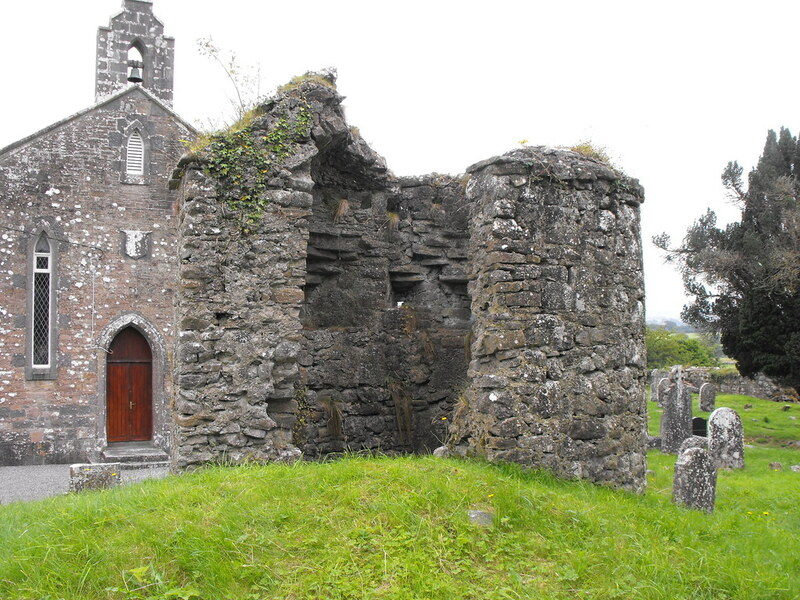 Description and History – Known as Seir Kieran this ecclesiastical site is made up of many features will be treated individually. 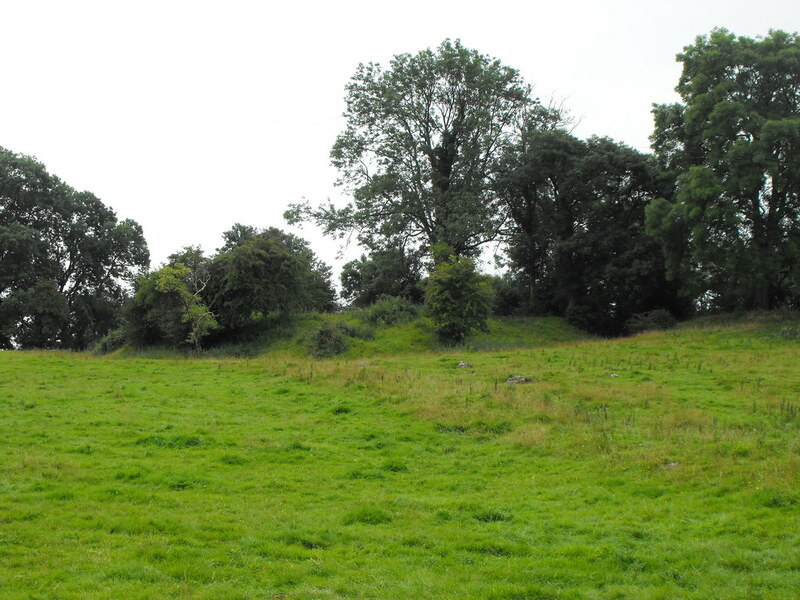 The complex is spread over, roughly, half a km of land and consists of: the remains of an 13th century Augustinian church, the remains of a round tower, the bases of two high crosses, 5 early Christian grave slabs, 16th century gun turret, a ringwork, various earthworks, a holy well and a rag tree. 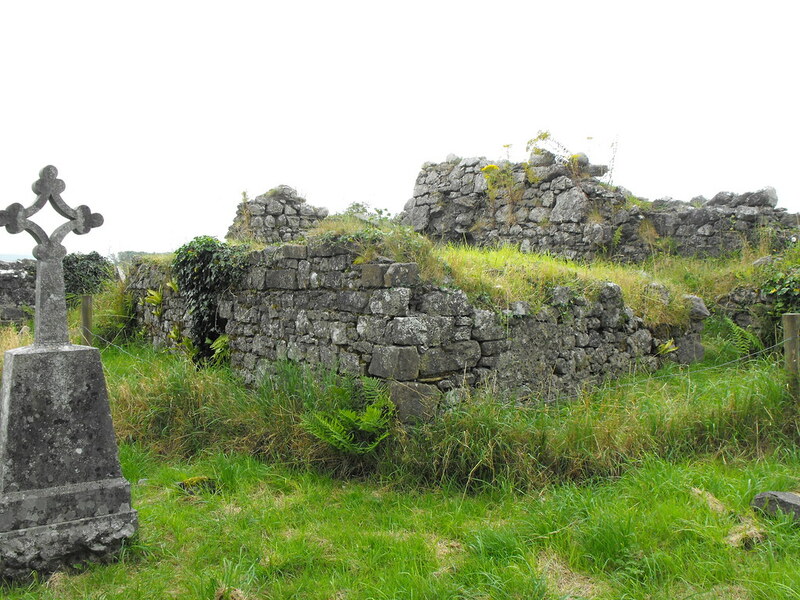 The site dates back to the 5th century when a monastery was founded by St Ciaran in c489AD. 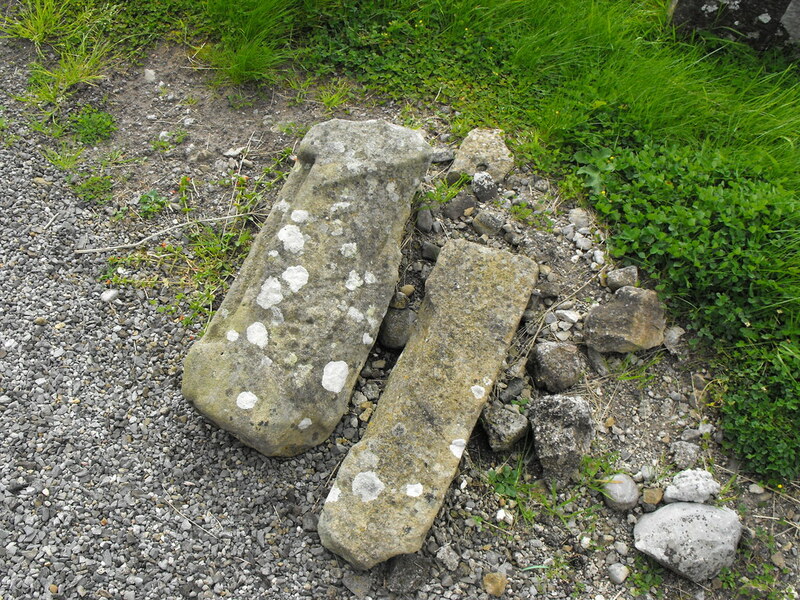 Nothing remains of the original structures. Augustinian church – The remains of the 13th century Augustinian church are in poor condition and only consist of portions of the N, S and E walls with a maximum height of 2m. Some elements of this church have been built into the modern Protestant church including a decorated quoin. 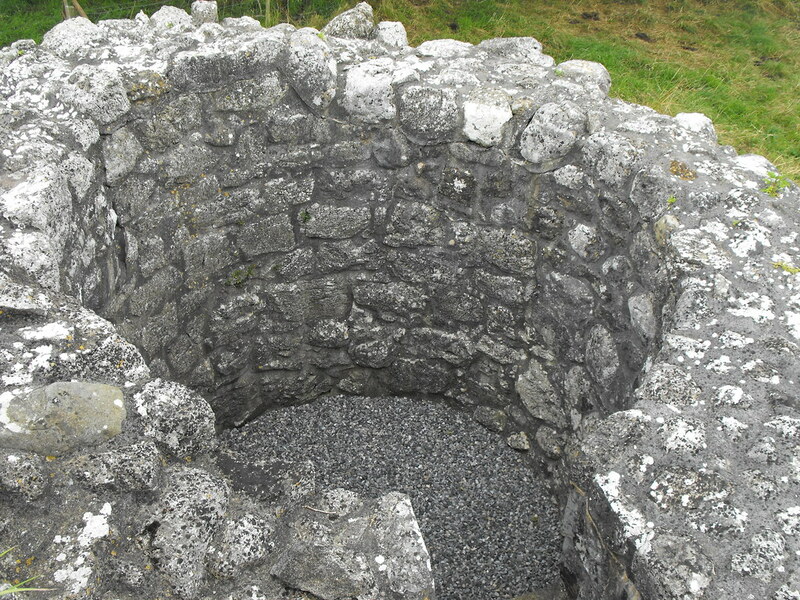 Round tower – Little remains of the round tower, but what is left has been recently restored. It now stands to the height of about 3m and is 3m in diameter. Cross base – A decorated cross base is located in the graveyard, not far from the gun turret. On its N face scriptural scenes have been carved while there is a battle scene on its S side. 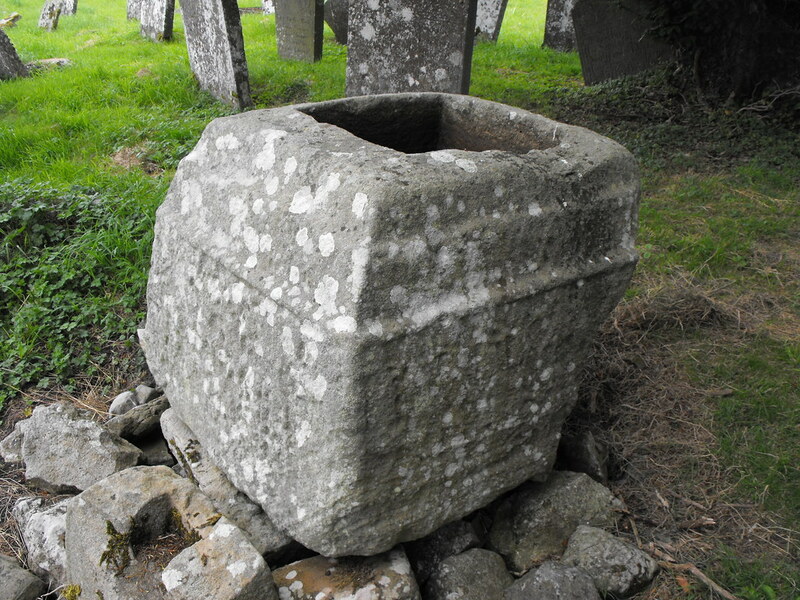 A smaller cross base is located beside it. Gun turret – This is an unusual feature to have in an ecclesiastical site. The turret is roughly 4m high and still retains part of its conical roof. Many gun-loops are still visible. 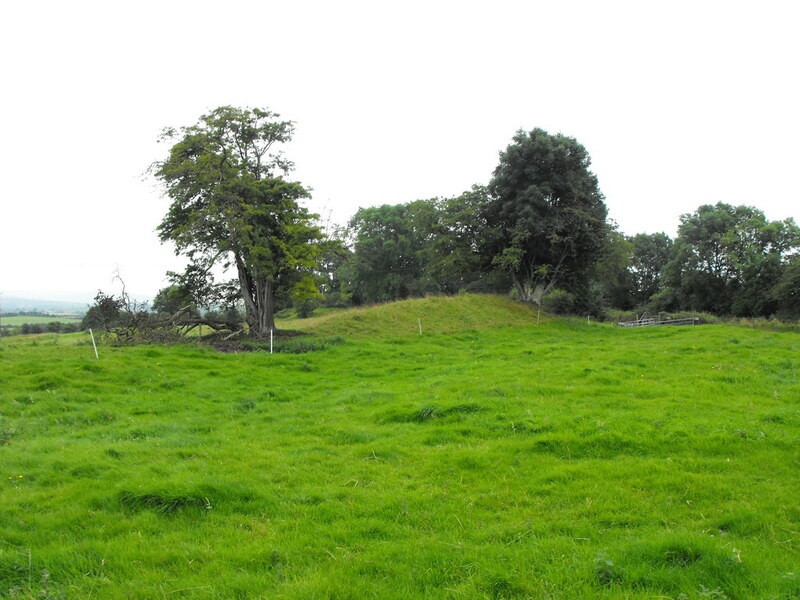 Ringwork – A rectangular ringwork is located to the W of the site and roughly 20m in diameter internally and 25 externally. 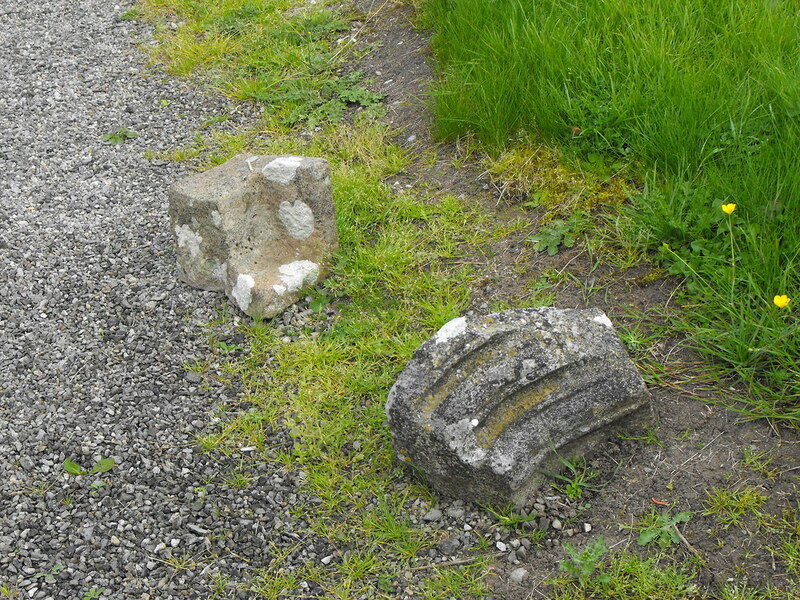 These are connected to the earthworks the surround the site. I need to go back and get some better pictures of this. 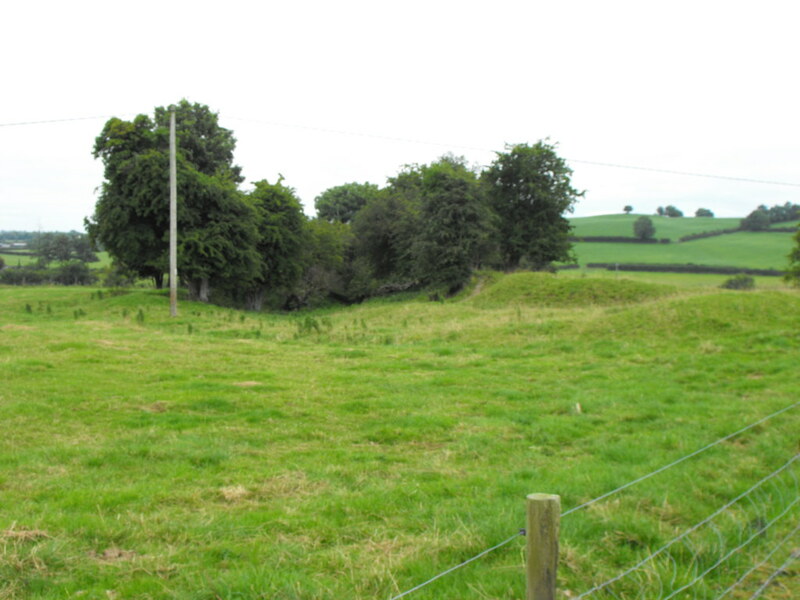 Earthworks – The purpose of these earth works is debated but it generally thought that these are defences for the site. Dating is also an issue and some have suggested that these are original but the majority date them sometime later. 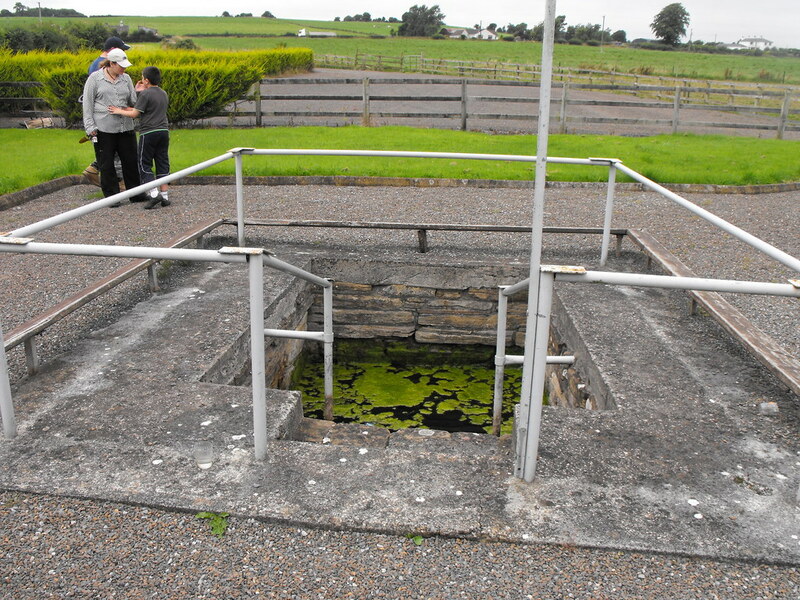 Holy Well – The holy well has been recently restored and is now unfortunately a concrete mess leading to a stagnant pool. 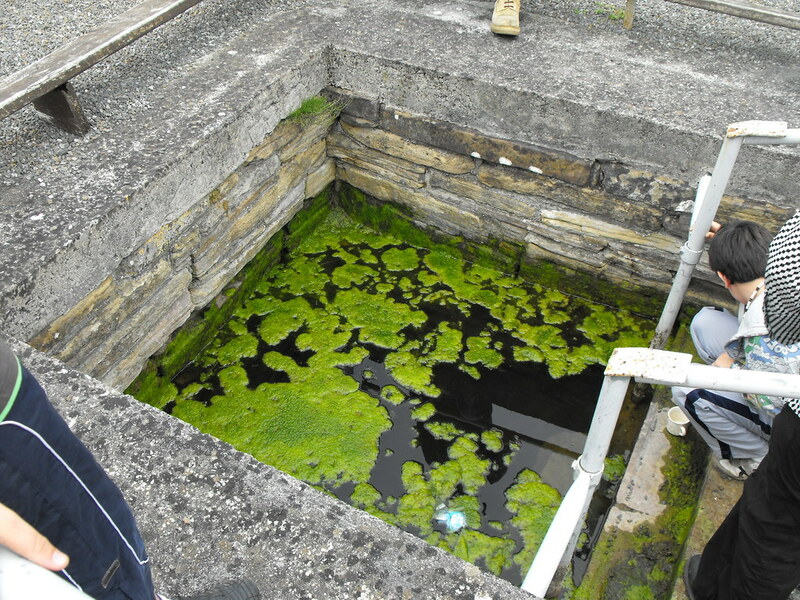 The well, as well as the whole ecclesiastical site, is dedicated to St Ciaran whose feast day is March 5th. 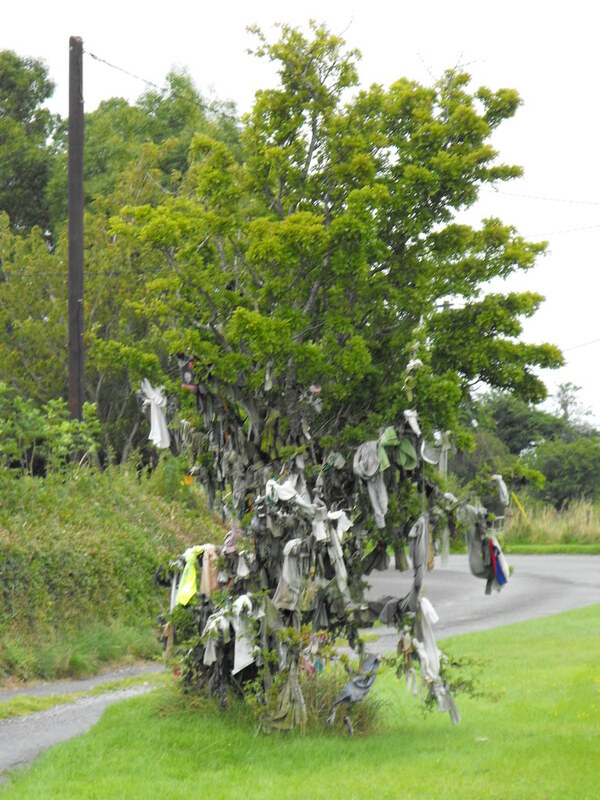 Rag tree – Located in a split in the R421, this rag tree is still in use. Difficulty – There are all easy sites and are signposted from the R421. I will have to revisit this site as my first visit was somewhat impromptu and I was not aware of everything in the site. 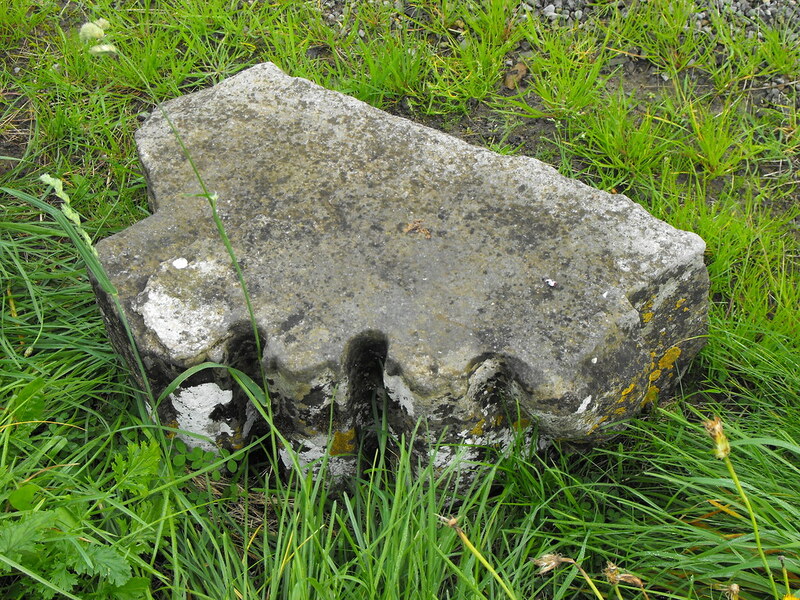 There are lots of architectural fragments dotted around the site.